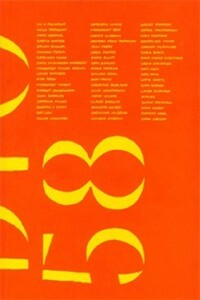 Studio 58: Women Artists in Glasgow since World War II was an exhibition and accompanying publication examining the period between World War II and the present day when women artists in Glasgow are at the forefront of the art scene in the city. 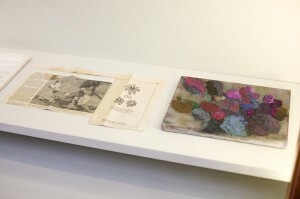 The title of the exhibition comes from the studio located on the top floor of the Mackintosh Building which historically was the dedicated work space for women students. Studio 58 installation view (2012), featuring works by (L-R) Hayley Tompkins, Louise Armour, Cathy Wilkes, Annette Heyer, Carole Gibbons, Laura Aldridge, Corin Sworn and Viola Paterson. 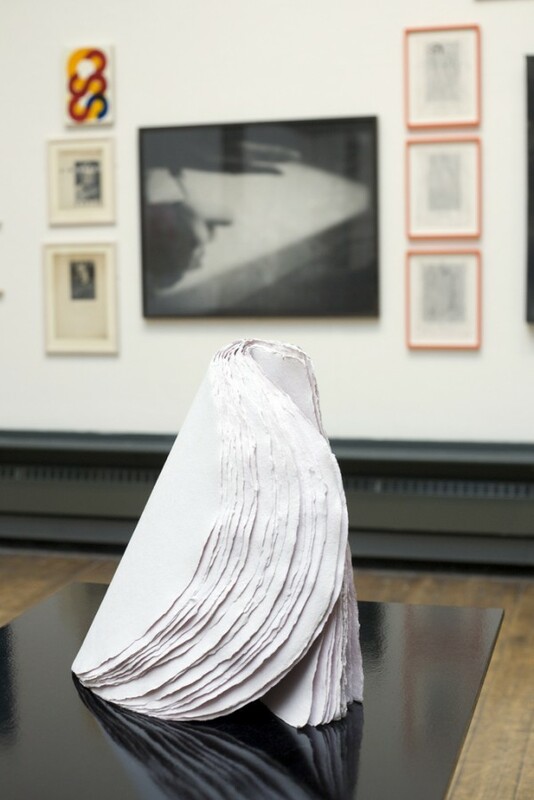 In recent years, a number of highly regarded women artists have emerged from the Glasgow art scene, including Turner Prize nominees Christine Borland, Cathy Wilkes and Karla Black. 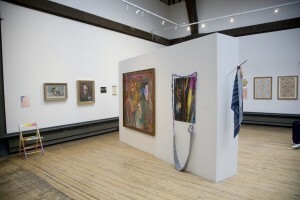 Studio 58 contextualised the work of contemporary women artists in Glasgow through documenting and displaying the little known and under-represented lineage of women’s art in the city from 1939 onwards, within the frame of the city’s art school where all of the artists included in the exhibition either studied or taught. 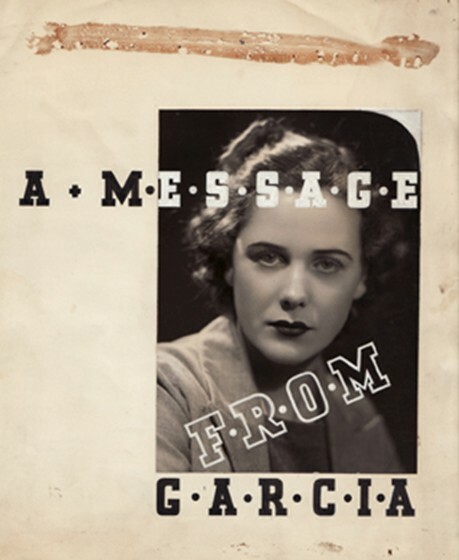 The most well known period, 1890 – 1930, has been documented in several publications and the recent exhibition ‘Glasgow Girls’ (2010), however the post-World War II period has not been subject to the same level of analysis. Studio 58 was organised around four thematic strands: landscape/still life, body/self, printed matter and photography/film and will focus upon the work of over 50 artists active from the late 1930s onwards. The 54 featured artists included Margaret Morris, Mary Armour, Ivy Proudfoot, and Kathleen Mann, as well as those that followed them including Joan Eardley, Margot Sandeman, Bet Low and Sam Ainsley and younger artists such as Cathy Wilkes, Claire Barclay, Victoria Morton, Hayley Tompkins and Karla Black. Studio 58 installation view featuring works by (L-R) Sophie Mackfall, Garcia Hunter, Christina McBride, Jacki Parry and Kate Davis. 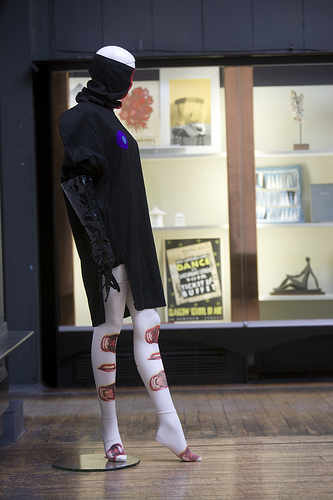 Studio 58 featured many seldom viewed works loaned from private collections and the collections of Glasgow Museums, The Hunterian Museum, The Glasgow School of Art Archives & Collections and Glasgow Women’s Library. There was a symposium to accompany the exhibition, a screening event and a live performance on the opening night of the exhibition by Romany Dear. High up in the Glasgow School of Art is Studio 58. It was once the domain of female art students with the stomach to succeed in a male-dominated institution – and bladders to match. As late as the 1950s, the students would have to dash during breaks from the studio to the only women’s toilet in the building. Decades on, Dr Sarah Lowndes snuggles into one of Charles Rennie Mackintosh’s beautifully crafted cubby-holes to talk about curating a new exhibition, Studio 58: Women Artists In Glasgow Since World War Two. It features art by 54 women who made their names and carved reputations in Glasgow. Nearby, 11 of the featured artists chat after having their photograph taken in the Mackintosh Library. It is a couple of days before their works are brought together, and the sense of excitement is palpable. For the past hour or so they have created a buzz that has echoed down the corridors and stairwells of the Mackintosh Building at the core of the art school. Among those featured in Studio 58 are Joan Eardley, Hannah Frew Paterson, Carol Rhodes, Sam Ainsley, Christine Borland and rising star Romany Dear. Some are more widely known than others, but all are innovators who have left their mark as artists, educators or mentors. Lowndes, who wrote Social Sculpture: The Rise Of The Glasgow Art Scene, is passionate about her latest exhibition. Put crudely, the show is payback time for an array of female artists, many of whom never received the recognition they were due. The exhibits, gathered from private and public collections, have in some cases been collecting dust for decades. Lowndes, who is married to the Turner Prize-winning artist Richard Wright, has her own theory as to why women artists have often received less acclaim than their male counterparts. “Some people have questioned the need to have this kind of exhibition,” she says, “but in wider society, the median pay gap in the UK is one of the worst in Europe.” The gap between full-time men’s and women’s earnings was 9.1% in 2011, according to the Office for National Statistics. “If you look at the art scene, that kind of inequality is replicated in things like the Turner Prize,” continues Lowndes. “Only four women have won it since it started in 1984. In the Tate Modern [in London], 83% of the works are by men. 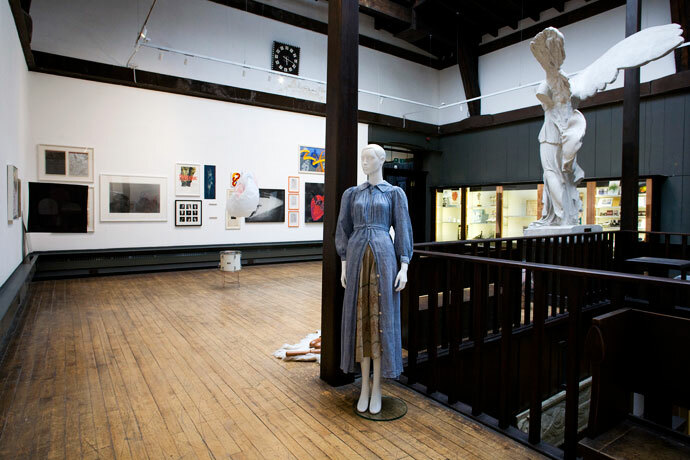 The art school, perched on Garnethill close to Glasgow city centre, is the thread that links the exhibitors. Among the women meeting today is the acclaimed artist Carol Rhodes, 53, who teaches painting at the art school. Born in Edinburgh, Rhodes spent much of her childhood in Bengal before returning to Scotland during her teens and beginning art school in 1977. Her aerial landscapes take their influence from Indian miniatures, which have the effect of flattening out people and objects, giving them the same priority on the canvas. Rhodes describes being a painter as “a bit lonely at times”. She recently opened a gallery, 42 Carlton Place, in the Gorbals, at the flat she shares with her partner, the artist Merlin James. Adele Patrick once shared the same concerns as Rhodes about a dominant art movement threatening to obscure other innovative work. She began studying a BA in embroidered and woven textiles at the school just as the New Glasgow Boys, including Peter Howson, Ken Currie and Steven Campbell, emerged. Patrick, 50, describes a post-punk era when conventions were being challenged in society – and in the art world. After graduating, Patrick co-founded the design company Graven Images with Janice Kirkpatrick and began teaching at the art school. Two decades ago, she helped launch the Glasgow Women’s Library as “a place and a space for women’s art, culture and writing”. Ainsley’s influence echoes down the decades and the acclaimed artist’s screenprints are being exhibited in Studio 58. Another name being talked about today is Hannah Frew Paterson. Unable to join her fellow exhibitors at the art school, the 81-year-old speaks to me at her home in Broomhill, Glasgow. An embroiderer whose work illuminates churches across Scotland – including St Margaret’s Chapel in Edinburgh Castle – she pushed the boundaries of a traditional art form until it squeaked. Encouraged by her mentor and lecturer, Kath Whyte, Paterson went on to teach at the art school for 22 years. The walls of her home are decorated with the work of former students, and she points to a piece by Whyte, which will be shown in the exhibition. On the stair landing sits her own work, Motivator, also being exhibited. An embroidery work almost like a sculpture, it was inspired by the burned-out motor of a food mixer sent for repair. Brought up in Chapelton, South Lanarkshire, Paterson is the daughter of a blacksmith and a grocery shop worker. Like so many of her generation, the young Paterson stepped aside to allow her brothers an education while she went out to work. “We weren’t very wealthy and my two brothers wanted to be architects, which was a long training,” she says. “It was never discussed – I just decided I should get on with it.” At 19, she began working as a designer for J&P Coats in Glasgow, but soon discovered a brave new world when the company sent her to the art school on day release. Paterson describes art school during the 1960s as daunting, but also exhilarating, since there was a sea change in teaching methods. Her section of the year group became known as “the inventors’ club”, due to their experimental work under inspiring tutors such as Whyte. She took early retirement to spend more time with Tom, who died shortly afterwards from cancer and heart problems. Awarded an MBE in 1992 for services to embroidery, Paterson has continued to make waves in the art world and through her church embroidery work. In the past few years she has experimented with three-dimensional textile forms “inspired by surfaces and objects in nature”. Almost 60 years her junior, Romany Dear is explaining how her work, March Your Legs Up And Down, will be performed live at Studio 58 by six dancers, including herself. At 23, she is the youngest artist in the exhibition. Cited by Lowndes as one to watch, Dear won the Gillian Purvis prize after her work impressed the sculptor Martin Boyce, and graduated from the Glasgow School of Art last year. More recently she won The Skinny and CCA Award for another live piece, The Art Of Hanging Around. Given she is white-hot, Dear is refreshingly grounded and surprisingly candid. “I do not earn a living out of my work,” she says plainly in an accent that hints at her Lancashire roots. “I work in a bar.” She explains she works in the art school union, describing it as “just a job – it covers my materials, travel, that kind of stuff”. Her work – which uses video, audio and performance to explore the way people move in different contexts – is what drives her. However, before that, she will join her fellow artists to bring Studio 58 to life in the Mackintosh Museum. The exhibition will be a reminder to the art-loving public of a time and place when it was perhaps more difficult for women artists to cut loose and take flight. After graduating from Glasgow School of Art (GSA), Steel was instrumental in running the city’s Transmission Gallery. Works with film, video and animation, and is developing a graphic novel. Graduated from GSA in 1990 and now teaches on the master of fine arts and photography programmes. McBride uses analogue photography and film, travelling widely for her research and artistic work. A graduate of GSA, Heyer staged her degree show in the original Studio 58. From Hamburg, she teaches painting and printmaking at GSA. Her piece, Holz, will be exhibited in Studio 58. The artist graduated with a masters degree from GSA and now lectures in the school’s department of sculpture and environmental. She created Travelling The Distance, commissioned for the Scottish Parliament after a year’s travelling around Scotland. An academic writer and the curator of the Studio 58 exhibition, Lowndes graduated from the University of Glasgow with a degree in film and television studies and English literature. She studied for an MPhil at GSA and began lecturing there in 2002. After graduating with a BA in embroidered and woven textiles at GSA, Patrick co-founded Graven Images design company in Glasgow while a postgraduate student. Helping launch the Glasgow Women’s Library 20 years ago, she continues to champion the work of female artists and writers. The Norwegian painter studied for a BA and master of fine art at GSA, where she was taught by Sam Ainsley, whom she describes as “completely inspirational”. See her work at the Equals exhibition at Paisley Museum this summer. A founder member of the Glasgow Print Studio and former head of printmaking at GSA, the Australian artist has lived in Scotland since 1965. She works with paper and print – her piece The Book And The Rose, created from handmade paper, will show at Studio 58. The Manchester-born artist represented by the Glasgow gallery Mary Mary is a graduate of GSA’s painting department. She will be exhibiting at Modern Art gallery in London from July 4. The artist was trained at GSA and the Rijksakademie van Beeldende Kunsten in Amsterdam. She works with film and video, and is developing an archive of experimental artists’ work in those media. Graduating from GSA last year, Dear works with experimental dance and choreography. Praised for her work by the Turner Prize winner Martin Boyce, she won the Gillian Purvis Trust award, and The Skinny and CCA Award. She works in a bar to fund her work and plans to travel. A teacher in painting at GSA, Rhodes is renowned for her aerial landscapes. She and her partner, the artist Merlin James, have launched a “casual” gallery, 42 Carlton Place, in their Glasgow home. Studio 58: Women Artists In Glasgow Since World War Two is at the Mackintosh Museum, Glasgow School of Art, July 7-September 30. Visit www.gsa.ac.uk/life/gsa-events. Photographs of Studio 58 by Janet Wilson, with the exception of the photograph of Romany Dear’s performance, which was taken by Martin Clark. The exhibition and catalogue were supported by The Glasgow School of Art, Glasgow Life and the Glasgow Society of Women Artists.